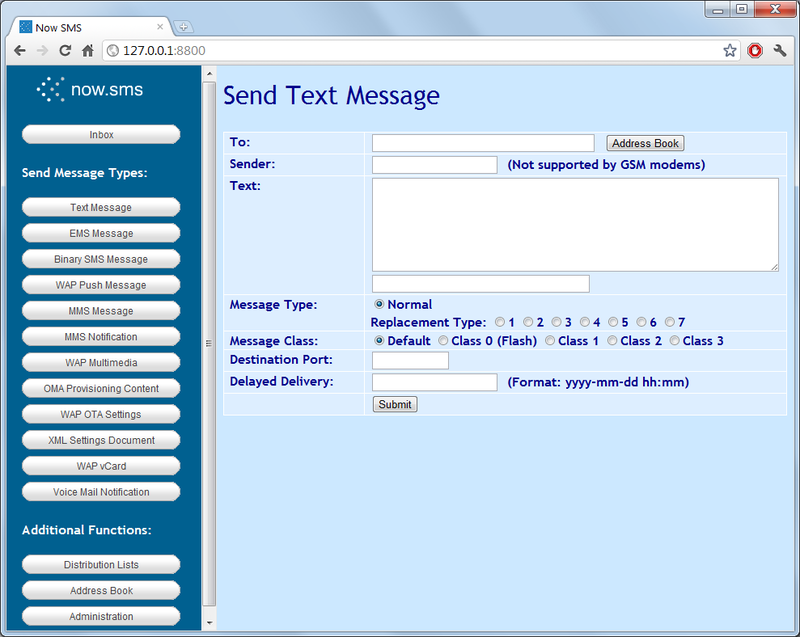 When the menu driven web interface is enabled, it is easy to test the ability of sending various types of SMS messages. To enable the menu driven web interface of the gateway, you must check “Enable menu driven web interface” on the “Web” configuration dialog. When that option is enabled, you can connect to the web interface with a web browser. On the “Web” configuration dialog, there is a setting named “Port number for web interface”. To connect to the web interface of the gateway, connect to http://ip.address:port, where “ip.address” is the IP address or host name of the PC running the gateway, and “port” is the port number specified for the web interface. In a default configuration, the web menu interface can be accessed on the gateway PC by pointing a web browser to http://127.0.0.1:8800. For more information on configuring the Web Menu Interface, see Configuring the Web Interface.